Foreword by Eugene H. Peterson This instructive, practical book explores the meaning of "biblical spirituality," a spirituality rooted in the Scriptures, in the grand story of God. 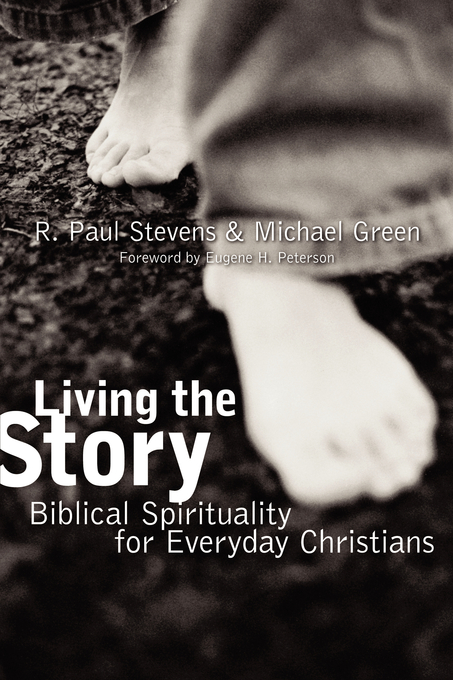 Writing to promote genuine discipleship and an everyday sense of God's presence, R. Paul Stevens and Michael Green show that biblical spirituality is based on down-to-earth principles meant to foster righteous living -- at home, at work, wherever one is. They highlight the importance of our being in relationship with the Triune God and discuss how we can be worshipers of Abba God, disciples of Jesus, and temples of the Holy Spirit. The book proceeds through the Old and New Testaments, engaging readers with the discoveries and struggles of people of faith from Adam and Eve to those gathered around the Lamb in the new Jerusalem. Stevens and Green focus throughout on how we can truly "live" the Word of God so that our own stories become part of God's great story of love. Filled with biblical wisdom and a pleasure to read, "Living the Story" is a winsome invitation to follow God wholeheartedly in every dimension of life. Living the Story: Biblical Spirituality for Everyday Christians by R.Paul Stevens;Michael Green was published by Eerdmans Publishing Company in June 2003 and is our 36928th best seller. The ISBN for Living the Story: Biblical Spirituality for Everyday Christians is 9780802860743. Be the first to review Living the Story: Biblical Spirituality for Everyday Christians! Got a question? No problem! Just click here to ask us about Living the Story: Biblical Spirituality for Everyday Christians.